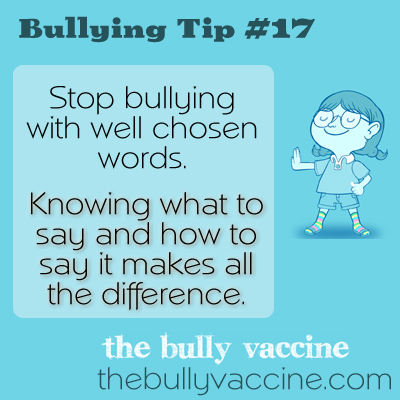 Bullying tip #17: Stop bullying with well chosen words. Why bullies bully and what you can say to get it to stop. It doesn’t take much to get bullying to stop. Just knowing what to say and how to say it is often all that is required. What words used – depends on what the problem is. Humor helps. The main things is to be calm and polite and direct. You aren’t bothered by what happened. You just think it is stupid and they are not going to get a rise out of you. Silence- is submission. I taught my son to say – Thank you very much for that information – it’s very helpful – whenever he was insulted. At one point he was being threatened by a kid on a bus who wanted him to say a bad word. I told my son to say – if you do that – I will report you. And report if it happens. The kid has to decide what they want to say. The adult helps them figure out what the retort will be and to practice it out loud with role play so that they actually are able to say it when under stress.